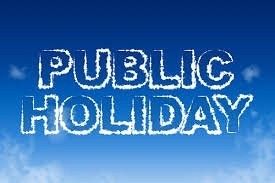 There will be some changes to services provided by Jubilee Community Care due to public holidays during April and May. Services on April 19, 22 and 25, and on May 6, will be affected. Essential services of personal care, medication assistance and meal preparation will be provided on these days while domestic assistance, social support, respite and shopping will not be provided. Also, the office will be closed on these public holidays. If you have any questions please phone Jubilee on 3871 3220.